Know when to plant vegetables in your gardens with our monthly vegetable planting calendar. You will soon see that over one year, you will have some indication of what you should be planting, when, and what chores need to be done throughout the year on your farms, backyards and homesteads. The following is a vegetable planting calendar for knowing what you can plant when, if you live in the northern hemisphere. When to Plant Globe Artichokes. During the month of January, the soil is still cold and therefore these plants aren't hardy at the moment and so you should protect them with mulch, once planted out. Asparagus . Asparagus beds should be heavily manured, if not already done, but the beds don't need to be dug. Place your manure, and the rains will wash this down into the roots feeding your plants. If you are lucky enough to live near the coast seaweed is the best of manure for Asparagus that you can get. Asparagus is a perennial and once planted in your vegetable garden, you will be harvesting for years. When to Plant Broad Beans. Broad beans may be sown in frames, and towards the end of the month in the open. For early crops select the long pod varieties. Sow on ground that has been deeply dug and well manured. When to Plant Cabbages. Cabbages may be planted out at any time when the weather permits, provided you have the plants; but make sure that you get them from a reliable source, or else varieties may be planted which will in a few weeks send up flower-stems instead of forming tender hearts. When to Plant Cauliflowers. Cauliflowers should be sown on a gentle hot-bed, or in a pan in the greenhouse, or even in a frame, to make a start for planting out in March or April. When to Plant Cress. The trick to planting cress is to have a constant succession of small, but frequent sowings. All types of cress are good, but differ in flavor, and they should be used only while young and tender. Sow at intervals of a few days in pans, as in the case of mustard, until it is possible to grow it out in the open, and then give them a shady position during summer on moist soil. When to Plant Cucumbers . Cucumbers are never ready too soon to meet the demand in early spring. They are grown in hot houses more or less adapted to their requirements, and also in frames over hot-beds. When to Plant Horseradish. It should be planted early, to ensure fine roots for next Christmas beef, in December. When to Plant Leeks. Those who wish to produce stems of superb size and beautiful texture, leeks must be sown during this month or early in February, for a longer period of growth is needed than for ordinary crops. When sufficient root growth has developed, transplant into larger pots, and in due course transfer these to a frame where the plants may be gradually hardened off for putting out into specially prepared trenches in April. When to Plant Lettuces. Lettuces are always in demand. Sow a few sorts in pans, in frames, or on gentle hot-beds, to be ready for planting out later. When to Plant Melons. In large gardens, three crops of Melons are usually grown in the same hot-house in one season. A light soil is advisable at the beginning of the year, but later in the season a heavier compost may be used. For the first sowing select an early variety, and at the beginning of this month put the seed into separate pots. Re-pot the plants once, and they will be ready for the beds by the first week of February. Melons from this sowing should be fit for your tables in May, which is as early as they can be produced with any sugar in them. When to Plant Mustard.—Those who like salads need a supply of mustard almost all throughout the year, and to secure a succession it is necessary to sow at regular intervals. It is a good plan to keep a few boxes in use for the purpose in a greenhouse or cold frame, sowing one or two at a time as required, and taking care not to sow too much. The seed may be sown outdoors all summer, on a shady patch, but nothing it better than boxes or large pans under glass. Mustard grows beautifully under glass. Mustard and Cress should never be sown in the same row or in the same pan, but separately, because they do not grow at the same pace, and mustard may be ready to use a week or so before the cress. When to Plant Onions.—The practice of sowing onion seed in boxes under glass is good for several reasons. It ensures a long season of growth and results in good bulbs, far above the average size. Transplanting allows one the opportunity of selecting the strongest seedlings and placing them at exact intervals in the bed. As a last advantage of this system it also seems to prevent attacks from the Onion Fly. Sow in boxes filled with rich soil and see that the plants have enough water, although very little is necessary until after transfer to other boxes. When to Plant Peas. - Round peas can be sown in the open, against a fence or trellis. If deep trenches are dug and a lot of manure is put in for peas, the ground is also then prepared for broccoli, celery, and late cauliflowers to follow; for the early-sown peas will be off the ground in time for another paying crop. Troughs for peas can be made in very little time out of waste wood that may be found in the yard; or a few lengths of old zinc spouting blocked up at the ends. In the absence of such things, flower-pots may be used. The seed should only be grown in hot houses at this stage of the year. Potatoes can be planted now. Cover with light rich soil, and use old frames for protection, with mulch handy in case of frost. Radishes are more or less in demand for the most part of the year. Grow in a sheltered and warm position until it can be planted out in a suitable position in the open. Sea Kale may be covered with pots or a good depth of mulch, or a combination of pots and mulch. This should be done early, and will generally be better than if forced. As the leaf-stems must be thoroughly blanched, they will need to be covered. When to Plant Spinach. Spinach can be sown in the open. If the frost destroys the plants, sow again. Keep the autumn-sown spinach clear of weeds, and when harvesting carefully pick the leaves so as to not damage the main plant. When to Plant Strawberries.—Seed Alpine strawberry varieties can be sown in pans this month. Later they can be transferred into the open ground, and they usually produce fine fruits in September. When to Plant Tomatoes All the tomatoes can be grown and ripened under glass. Cold frames can be used when sown either in pots or planted out. The soil should be prepared and left to rest in the autumn. It should not be too rich, or there will be too many leaves and not enough tomatoes, and the flowering will also be late. A compost of leaf-mold and loam with an addition of sand suits tomatoes well; but don't use raw manure. It has to be well-rotted. Sow thinly in well-drained pots firmly filled with soil, and place in a temperature of 60° or 65° F. When large enough to handle, transfer the seedlings to small pots, and, if necessary, shade them for a few days. Keep them near the glass until the roots are well established. February is the time for digging, liberal manuring, and cleaning up. Many weeds, especially groundsel, will now be coming into flower, and if allowed to seed will make enormous work for you later on. Remember, however, that weeds of all kinds, so long as they are not in flower, are really useful as a green manure when dug into the soil, and can be used as a liquid fertilizer if allowed to rot in water. Therefore a weedy patch is not the end of the world, see it as a bonus; but if the weeds are not stopped in time and they are allowed to flower, they spread by their seeds and will cause you no end of weeding to come. Dig them in, and you will have a green manure for the next crop. If you are going to sow your vegetable seeds early, make sure that you have materials such as straw, spruce branches, mats etc. to help protect your crop from the frost. Artichoke, Globe.—Plants from a sowing made now in a frame, and transferred into the open at the end of April, will generally produce heads in the following August, September, and October. When to Plant Artichokes, Jerusalem. They may be planted this month where it has been possible to prepare the ground. Use whole sets if convenient, or plant cut sets with about three eyes in each. When to Sew Broad Beans. These may be sown both for early and main crops now, and with but little risk of damage by spring frosts. The driest and warmest situation should be selected for the early sorts, and the best land for the late ones. If sowings were made in frames last month, take care to harden the plants before planting out; if caught by a sharp frost, you will probably lose the lot. When to Plant French Beans—Make a sowing of Dwarf French Beans in cold frames, and of the Climbing French Bean varieties in greenhouses or other available spaces under glass. When to Sew Beets.—Sowings of the Globe beets can be made this month and in March, on a gentle hot-bed under frames, to get them going early. When to Plant Broccoli.—Sow in a warm, sheltered area, and also in a frame. When to Plant Brussels Sprouts.—Sowing should be made now in a warm area. This is a slow growing vegetable. If you don't end up sowing sprouts early, you won't get the tight little heads you are after. When to Plant Cabbage. Cabbage may be sown in pans or boxes placed in cold frames which will later be planted out. When to Plant Capsicum and Chili. Both of these should be sown now or in March on a hot-bed, and be potted out when the plants are fit to be placed in the greenhouse or a conservatory. When to Plant Cauliflower.—Another sowing should be made under glass to supply a succession of plants. When to Plant Corn Sala. This thrives well in any soil not particularly heavy, the best being a sandy fertile loam. Sow in drills six inches apart; keep the weeds down, and when ready thin the plants out to six inches apart. They should be eaten young. When to Plant Eggplant/Aubergines.— Eggplants are very important in French Recipes Italian Recipes, and they make a delicious dish when properly cooked. Seed may be raised in heat, but when summer comes the plants thrive in rich soil at the foot of a wall facing south. The white and purple varieties are grown as ornament as well as for cooking. Sow now or in March in heat, and in June the plants should be ready for transferring to rich soil in a sheltered spot, allowing each one a space of two feet. When to Plant Garlic. Garlic should be planted in rows, nine inches apart each way, and two inches deep in rich soil. When to Plant Lettuce.—Sow again on a warm border and in frames. Plant out in mild weather any that are fit from frames and hot-beds, first making sure that they are well hardened. When to Plant Mustard.—It is easy work with a frame to have Mustard at any time; and many small sowings are better than large ones, which only result in waste today and want tomorrow. When to Plant Onions.—There is still time for sowing seed in boxes preparatory to planting out in April. When to Plant Parsley. Parsley can be sown in the latter part of the month. When to Plant Parsnips. Parsnips should be sown as early as possible, on good soil, but not too rich, because like carrots, they will fork. When to Plant Peas.—Sow early sorts in quantity now but don't sow them on soggy ground or during bad weather as the seed will rot and come to nothing. There is time yet for sowing mid-season and late peas. Some people sow many rows of peas in a plot rather close together, but it is better to put them far apart so that two or three rows of early potatoes can be grown between every two rows of peas. This ensures lots of light and air to the peas, and the peas in turn protect the potatoes from May frosts. An ideal situation of companion planting. A warm, dry, fertile soil is needed for first-early peas. As they grow fairly quickly, if you end up sowing them too early and they are affected by the weather, it is best to dig them in and start again. Where early rows are doing well protect them much as you can from any chance of bad weather. Remember peas, corn and pumpkins grown together is an excellent example of permaculture, and is commonly known as a 3 sisters garden. When to Plant Radishes. Radishes to be mild, tender, and not woody must be grown quickly. Mulching will help protect the plants from any frost. Rhubarb. Rhubarb should be taken up and divided, and planted again in rich moist soil, with each piece having at least one good eye. Never pick rhubarb from newly planted plants, but rather wait a year before you harvest from these plants. This allows the plants to be really established, and will produce better for you in the future. When to Plant Savoys. Savoys can be enjoyed when small, or large, and seem to taste better if they have been affected by some frost. If you are after large savoys make sure that you sow them quickly, either in a frame, or in a well prepared seed bed, and transplant them before they become crowded. Sea Kale.— Open-ground Sea Kale can be uncovered as soon as it is cut, but a little mulch should be given to give protection and help the young shoots to rise again, because after blanching the cutting is a severe strain on the plant, and it has to begin life again and prepare for the work of the next season. When to Plant Shallots.—When well grown the clumps are bigger than a man's fist, and each separate bulb thicker than a walnut. To grow them well they must have time; so plant early, on rich ground, in rows one foot apart and the bulbs about nine inches apart. Press them into the earth deep enough to hold them firmly, but not quite buried. When to Plant Spinach.—Sow the thickly. However, if you end up sowing too much seed the extra crop can always be given to your chickens or dug into the ground as a green manure. When to Plant Tomatoes.—If you plant tomato seeds this month, and if all goes well, you should be able to get tomatoes on your plants within 4 months of sowing. Use good soil for the seed trays. Sow very thinly in a temperature of 60° or 65° F., and get the plants into smaller pots while they are quite small. When to Plant Turnips. Turnips may be sown on warm borders, but it is too early to plant enmass out in the open. March is the great season for garden work seed beds should be carefully prepared and your vegetable gardens cleaned up ready for the growing season. Where early-sown crops have failed, dig them back into the soil and sow again. It doesn't cost too much these days to buy a packet of seeds and there is no point in trying to coax a patch of a certain vegetable that is doomed for failure. If you have plants in frames at this stage, the temperatures can rise during the day, so it is important that you open them a little on the warmer days to give your plants ventilation. If you are wondering when to plant vegetables - vegetable seed of almost every vegetable grown in the garden can be sown during the month of March. Make successive sowings and it is probably at this stage far better to raise them in hot houses, frames or greenhouses before you think about putting them in outside beds as you never know what the weather will do at this stage. Very important indeed it is now to secure a Hot-bed.—To make one is easy enough. In the first place, secure a great bulk of manure, and if it is long and green, turn it two or three times, taking care that it is always moderately moist, but never actually wet. If the stuff is too dry, sprinkle with water at every turn, and let it steam away to take the rankest fire out of it. Then make it up where required in a square heap, allowing it to settle in its own way without treading or beating. Put on a foot-depth of light, rich soil after the frames are in their places, and wait a few days to sow the seed in case of a great heat rising. When the temperature is steady and comfortable, sow seeds in pots and trays, as needed, the quantity required of each separate crop, and stand them on bricks above the bed, so that the heat doesn't damage the plants. In the course of a few days finish the work by putting in a body of earth. Do not attempt to hurry the growth of anything too much, because if you do you will only get a weak plant. Rather give air and plenty of light, and the plants will be short and healthy from the beginning. Globe Artichokes.These need to be cleared of protecting material as soon as weather permits, and made ready for suckers to be put in next month. A new plantation may also be formed by sowing seeds; in fact, a sowing ought to be made every year. Where early produce is required, the plants should be protected during winter to supply suckers in the spring; but, if late supplies suffice, the sowing of a few rows every year will reduce the labor, and the production of Globe Artichokes becomes a very simple affair. When to Plant Jerusalem Artichokes. Jerusalem artichokes may be planted now. Strong, deep soil produces the best crop, and large roots are always preferred by the cook, because of the inevitable waste in preparing this vegetable. The Jerusalem Artichoke is certainly not properly appreciated, and one reason is that it is often carelessly grown in any out-of-the-way starving corner, whereas it needs a sunny, open spot, and a strong, deep soil, and plenty of room. To hide an ugly fence during summer no more useful plant is grown. 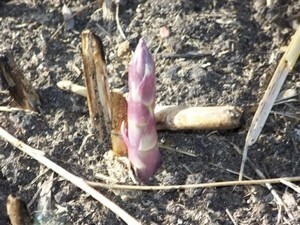 When to Plant Asparagus.—Little attention is required as yet, except to remove every weed as soon as it can be seen. If the beds are dry, and there are no indications of coming rain, one good soaking of water or weak sewage will be very beneficial. Mark out and make beds for sowing seed next month. When to Plant Broad Beans. Plant out those raised in frames, and earth up those from early sowings that are forward enough. Sow for main crops and late supplies. In late districts a few of the earliest sorts may be sown to come in before the Windsor section. When to Plant Beets.—Sow a little seed for an early supply, in well-dug mellow soil. The crop will need protection in the event of frost. When to Plant Broccoli for autumn use to be sown early; and at the end of the month sow again in quantity for winter supplies. In mild weather, put out the plants from the earlier sowings made in frames as soon as they are fit and well hardened. When to Plant Brussels Sprouts.—Look after the bed sown last month, and sow again for the main crop. The best possible seed-bed is wanted and a rich well-tilled soil for the plants when put out. When to Plant Cabbage of two or three kinds should be sown now to supply plants for filling up as crops are taken off, and also to patch and mend where failures happen. Where the owner of a garden has opportunities of helping his poorer neighbors, he may confer a real benefit by supplying them with Cabbage and Winter Greens for planting in their garden plots. Cottagers too often begin with bad stocks—very much to their discouragement in gardening, and to the loss of wholesome food the garden should supply. The rankest manure may be employed in preparing ground for Cabbage, reserving the well-rotted manure for seed-beds and other purposes for which it will be required. A sowing of Red Cabbage now will insure heads for pickling in autumn. When to Plant Carrots.—Sow one of the quick-When to Plant Vegetables - varieties at the first opportunity, but wait for signs of settled spring weather to sow the main crops of large sorts. When to Plant Cauliflower.—Plant out as weather permits from hand-lights and frames, choosing the best ground for this vegetable. In preparing a plot for Cauliflower, use plenty of manure; and if it is only half-rotten, it will be better than if it were old and mellow. When to Plant Celeriac.—So far as seed sowing is concerned, Celeriac may be treated in the same way as Celery. When to Plant Celery.—For the earliest supply, sow on the first of the month a pinch of seed of one or more of the smaller red or white sorts on a mild hot-bed, or in a hot-house. As soon as the plants are large enough to handle, prick them out three inches apart on a nice mellow bed of rich soil on a half-spent hot-bed; give them plenty of light, with free ventilation as weather allows, and constant supplies of water. About the middle of the month sow again and prick out as before; but if no hot-bed is available, a well-prepared bed in a frame in a sunny position will answer; or, if the season is somewhat advanced, a bed of rotten manure, two or three inches deep, on a piece of hard ground, will suffice, if the plants are kept regularly watered. From this bed they will lift with nice roots for planting out, scarcely feeling the removal at all. When to Plant Chives. These are to be divided and re-planted on a spot which has not previously been occupied with the crop. When to Plant Cucumbers.—The vines should now be in a flourishing condition, but it is necessary to look forward to the day when they will have yellow leaf. More seed sown singly in pots will provide a succession of plants. Re-pot them once or twice if desirable, and when large enough turn them out between the first lot. As the old plants fail, the new-comers will supply their places. Setting the bloom, as it is called, is not only useless, but is a mischievous procedure. It results in the enlargement of one end of the fruit, and ruins its appearance. If seed be the object, of course the process is justifiable; but for the table a 'bottle nose' cannot be regarded as an ornament. Besides, the ripening of seed in a single fruit will materially diminish the usefulness of the plant, and perhaps entirely end its career. Stopping the vine is a necessity, but it should not be done too soon. In the early stage of growth, it reduces the vigor of the plant and retards its fruiting; but when the fruit is visible, stopping aids its development and at the same time tends to regulate and equalize the growth. Frame culture of Cucumbers is usually begun in March. There are people who can produce fruit from hot-beds all the year round, but it is a difficult task, and as a rule ought not to be expected. At this time of year, however, success is fairly within reach of ordinary skill. In the early part of the month put seed singly into pots which must be kept in a warm, moist place. The plants will then be ready for frames at the end of the month. The most important business is the preparation of the bed, and in this, as in all else, there is a right and a wrong way of doing the work. Accurately set out the space on which it is to be made.If there is plenty of manure, make the bed large enough to project eighteen inches beyond the lights all round. But if manure is scarce, cut the margin closer, and trust to a hot lining when the heat begins to flag. Start with the outside of the bed, employing the long stuff in its construction; and keep this part of the work a little in advance of the center until the full height is reached. A bed made in this way will not fall to pieces, and the heat will be durable in proportion to its size and thickness. Where fallen leaves are abundant, they should be used for the middle of the bed, and they will give a more lasting heat than short manure. 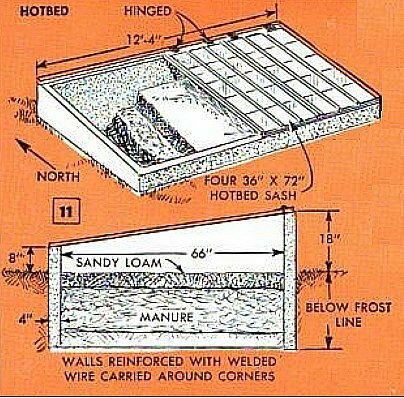 When the bed has settled down to a steady temperature, add six or nine inches of mellow loam over the entire surface, upon which place the frames. It is usual to have two plants under each light, but where the management is good, one is quite enough. The subsequent work consists of shading and sheltering, to prevent any serious check from trying weather, and in giving just water enough and no more. The fermenting material should sustain the temperature of the frame, even during frosty nights, and mats will screen off strong sunshine as well as cold winds. The plants will need stopping earlier than those grown in houses, and as there are no hot-pipes to dissipate the moisture, rather less water will be necessary, both in the soil and from the syringe. But the water employed should always be of the same temperature as the bed. This is easily managed by keeping a full can standing with the plants. In large frames, where there is a good body of manure and the loam is mellow and turfy, pieces of Mushroom spawn can be inserted all over the bed. The Mushrooms may appear while the bed is in full bearing; but if they do not they will come when the plants are cleared out, and pay well to keep the lights in use another month or so. When to Plant Garlic . Garlic may still be planted, but no time is to be lost. When to Plant Herbs of many kinds may be sown or divided, and it will be necessary to look over the Herb quarter and see how things stand for the supplies that will be required. A little later, excess of work may prevent due attention to this department. When to Plant Horseradish. This needs to be planted, if not done already. When to Plant Kohl Rabi, or Knol Kohl, to be sown in small quantity at the end of the month, and onwards to August, as required. If cooked while young, the bulbs are an excellent substitute for Turnips in a hot, dry season. When to Plant Leeks.—Sow the main crop in very rich, well-prepared soil, and rather thickly, as the seedlings will have to be planted out. With a little management this sowing will yield a succession of Leeks. When to Plant Lettuce.—Plant out and sow again in quantity. All the kinds may be sown now, but make sure of enough of the Cos and smaller Cabbage varieties. In hot, dry soils, where Lettuces usually run to seed early, try some of the red-leaved kinds, for though less delicate than the green and white, they will be useful in the event of a scorching summer. Lettuces require a deep free soil with plenty of manure. When to Plant Melons.—Raise a few seeds singly in pots, in readiness for putting under frames on hot-beds next month. Re-pot the plants, and repeat the process if the beds are not ready, for Melons must not be starved, especially in the early stage of growth. Some growers make up the beds in March, and sow upon them when the heat becomes steady, but the practice is somewhat precarious. In a cold, late spring the heat may not last a sufficient time to carry the plants safely into warm weather. Hence it is more reliable to raise them now in a warm house, and make the bed at the beginning of April. When to Plant Onions.—The plants already raised in boxes to be removed to cold frames. If necessary, they should be pricked off into other boxes in order to avoid overcrowding. Keep the frames close at first, but give air with increasing freedom as the time approaches for transfer to the open ground. Sow the main crop in drills nine inches apart, and tread or beat the ground firm. This crop requires a rich soil in a thoroughly clean and mellow condition, and it makes a capital finish to the seed-bed to give it a good coat of charred rubbish or smother ash before sowing the seed. When to Plant Parsnips.—Sow main crop in shallow drills eighteen inches apart in good soil deeply dug. The seed should be lightly covered, and new seed is indispensable. When to Plant Peas.—Sow the finest sorts of peas. Take care to put them on the best seed-bed that can be made, and allow sufficient room between the taller sorts for a few rows of Cabbage, Broccoli, or Potatoes. A crowded quarter of Peas is never satisfactory; the rows smother each other, and the shaded parts of the haulm produce next to nothing. When to Plant Potatoes.—A small quantity for early use should be planted at the opening of the month when the ground is dry and the weather soft. If planted when frost or cold winds prevail, sets may become somewhat shriveled before they are covered, and every care should be taken to prevent such a check to the initial vigor of the plant. The first-early sorts will necessarily have the chief attention now, and warm sheltered spots should be selected for them. Any fairly good soil will produce a passable crop of Potatoes; but to secure a first-class sample of any early sort, the ground should be made up with the aid of turfy soil and charrings of hedge clippings and other light, warm, nourishing material. Strong manures are not to be desired, but a mellow, kindly, fertile soil is really necessary, and it will always pay well to take extra pains in its preparation, because all the light rubbish that accumulates in yards and outhouses can be turned to account with only a moderate amount of labor, and the result of careful appropriation of such rubbish will be thoroughly satisfactory. Burn all the chips and sticks and other stubborn stuff, and lay the mixture in the trenches when planting, so that the roots may find it at their first start. As the Potato disease does not usually appear until late in summer, early planting is a safe precaution, for it insures early ripening of the crop. The planting of main crops may commence towards the end of March and be completed during April, according to the locality and the condition of the soil. When to Plant Radishes.—From March to September make successive sowings in the coolest place that can be found for them. When to Plant Scorzonera. It should be treated much the same as Salsify. See note on the latter under April. When to Plant Sea Kale. It should be sown in well-prepared beds; or plantations may be made of the smaller roots of the thickness of a lead pencil, and about four inches in length. Plant them top end uppermost, and deep enough to be just covered. When to Plant Spinach.—Sow in plenty. The Perpetual or Spinach Beet should not be forgotten. This is one of the most useful vegetables known, as it endures heat and cold with impunity, and when common Spinach is running to seed the Perpetual variety remains green and succulent, and fit to supply the table all the summer long. When to Plant New Zealand Spinach. is another excellent vegetable in high summer when the Round-seeded variety is worthless. The plant is rather tender, and for an early supply the seed must be sown in moderate heat, either in this month or in April. When large enough, get the seedlings into small pots, and gradually harden them before planting in the open about the end of May. When to Plant Strawberries.—Spring is undoubtedly preferable to autumn for planting, and results in a finer crop of fruit in the following year. Just as growth is commencing is the most favorable time, and this, of course, depends on the character of the season. Alpine Strawberries may be sown outdoors this month or in September for fruiting in the succeeding year. When to Plant Tomatoes.—In ordinary seasons and in the southern counties there is no difficulty in producing handsome tomatoes in the open border; but to ripen the fruit with certainty it is imperative that an early variety be chosen. With the rise of latitude, however, the crop becomes increasingly precarious, until in the North it is impossible to finish tomatoes without the aid of glass. For plants which are to ripen fruit in the open, a sowing should be made early in the month, in the manner advised under January. Plants which are ready should be transferred to small thumb pots. Put them in so that the first leaves touch the rim of the pot, and place them in a close frame or warm part of the greenhouse for a few days until the roots take hold. To save them from becoming leggy, give each plant ample space, and avoid a forcing temperature. A shelf in a greenhouse is a good position, and plants in a single row upon it will grow stout and short-jointed. Thrips and aphids are extremely partial to tomatoes. Frequent sprinklings in bright weather will help to keep down the former, and will at the same time benefit the plants. Both pests can be destroyed by fumigating with tobacco, and when the remedy is to be applied water should be withheld on that day. A moderate amount of smoke in the evening and another application in the morning will be more destructive to the vermin, and less injurious to the plants, than one strong dose. The usual syringing must follow. Plants for the open ground must not be starved while in pots; they will need potting on until the 4-1/2-inch or 6-inch size is reached, and it is important that they should never be dry at the roots. Shading will only be necessary during fierce sunshine; in early morning and late in the afternoon they will be better without it. When to Plant Watercress.—It is quite a mistake to suppose that a running stream is requisite - this plant, and it is equally a mistake to suppose that the proper flavor can be secured without the constant use of water. Sow in a trench, water regularly and copiously, and mild and tender Water Cress will reward the labor. When to Plant Winter Greens of all kinds to be sown in plenty and in considerable variety; for in the event of a severe winter some kinds will prove hardier than others. Vegetation is now in full activity, the temperatures are increasing rapidly, frosts are less frequent, and showers and sunshine alternate. The gardener must promote the growth of his crops by all the means possible; by plying the hoe to keep down weeds and open the soil to sunshine and showers; by thinning and regulating his plantations, that air and light may have free access to the plants left to gain maturity; by continuing to shelter as may be needed; and by administering water during dry weather, that vegetation may benefit from increasing sunlight. When to Plant Globe Artichokes.—Suckers to be put in the plantations prepared for them last month, in rows three to four feet apart each way. When to Plant Asparagus.—- Rake off into the alleys the remnant of manure from the autumn dressing, and as soon as the weather is favorable give the beds a light application of salt. If new beds are required, there must be no time lost either to sow seed or get in plants. Our advice to those who require only one small plantation is to form it by planting strong roots; but those who intend to grow Asparagus largely may sow down a bed every year, until they have enough, and then leave well alone; for a bed properly made will last ten years at the very least, if taken care of. It has been clearly demonstrated that this much-esteemed vegetable may be grown to perfection in any garden with little more expense than attends other crops, provided only that a reasonable amount of skill is brought to bear upon the undertaking. A deep, rich, sandy loam suits it. Dig in a good body of manure, and provide a mellow seed-bed. This being done, care must be taken to sow thinly, and, in due time, to thin severely; for a crowded plant will never supply fat sticks. Beds may be made by planting roots instead of sowing seeds, but the roots must be fresh, or they will not prosper. The advantage of using plants is that 'grass' may be cut earlier than when produced from seed. When to Plant Beans, Broad.—- Sowings may be made until the middle of this month, after which time they are not likely to pay, especially on hot soils. It is customary to top Beans when in flower, and the practice has its advantages. In case the black fly takes possession, topping is a necessity, for the insect can only subsist on the youngest leaves at the top of the plant, and the process pretty well clears them away. When to Plant Dwarf French Beans . These may be sown outdoors at the end of the month, but not in quantity, because of the risk of destruction by frost. Much may be done, however, to expedite the supply of this popular vegetable, and sowings in boxes placed in gentle heat or under the protection of a frame will furnish plants which may be gradually hardened off for transfer to the open in May. In proportion to the means at command, early sowings outdoors will live or die, as determined by the weather, although a very little protection is sufficient to carry the young plants through a bad time in the event of late frosts and storms. But sowings made at the end of the month will probably prosper. When to Plant Climbing French Beans.—Sowings of the Climbing French Bean may be made this month as directed for the Dwarf French class: the earliest in gentle heat for transplanting, and later on in open quarters for succession crops. When to Plant Beets.—At quite the end of the month sow in drills, a foot or fifteen inches apart, on deep, well-dug ground, without manure. Large Beets are not desired for the kitchen; but rather small, deeply colored, handsome roots are always valued, and these can only be grown in soil that has been stirred to a good depth, and is quite free of recent manuring. When to Plant Broccoli.—Make another sowing of several sorts, giving preference as yet to the early varieties. In particularly late districts, and, perhaps, pretty generally in the North, the late Broccoli should be sown now, but in the Midlands and the South there is time to spare for sowing. Be particular to have a good seed-bed, that the plants may grow well from the first; if the early growth be starved, the plants become the victims of club and other ruinous maladies. When to Plant Brussels Sprouts.—In many households late supplies of Brussels Sprouts are much valued, and as the crop is capable of enduring severe weather, a supplemental sowing should always be made during this month. Rich soil and plenty of room are essential. When to Plant Cabbage.—Sow the larger kinds for autumn use, and one or two rows of the smaller kinds for planting in odd places as early crops are cleared off. Cows, pigs, and poultry will always dispose of surplus Cabbage advantageously, so there can be no serious objection to keeping up a constant succession. Plant out from seed-beds as fast as the plants become strong enough, for stifling and starving tend to club, mildew, and blindness. Where Red Cabbage is in demand for use with game in autumn, seed should be sown now. When to Plant Cardoons. They should be sown on land heavily manured in rows three or four feet apart, the seeds in clumps of three each, eighteen inches apart. They are sometimes sown in trenches, but we do not approve of that system, for they do not require moisture to the extent of Celery, and the blanching can be effectually accomplished without it. Our advice is to plant on the level, unless the ground is particularly dry and hot, and then trenches will be of great service in promoting free growth. To insure their proper flavor, Cardoons must be large and fat. When to Plant Carrots.—Sow the main crops and put them on deeply dug ground without manure. When to Plant Cauliflowers.They should be planted out at every opportunity, warm, showery weather being most favorable. If cold weather should follow, a large proportion of the plants will be destroyed unless protected, and there is no cheaper protection than empty flower-pots, which may be left on all day, as well as all night, in extreme cases when a killing east wind is blowing. Sow now for late summer and autumn use, prick the plants out early to save buttoning, and they will make a quick return. When to Plan Celery.—Sow in a warm corner of the open ground on a bed consisting largely of rotten manure. It may happen in a good season that this outdoor sowing will prove the most successful, as it will have no check from first to last, and will be in just the right state for planting out when the ground is ready for it after Peas and other early crops. If Celery suffers a serious check at any time, it is apt to make hollow stems, and then the quality is poor, no matter to what size the sticks may attain. Prick out the plants from seed trays on to a bed of rotten manure, resting on a hard bottom, in frames or in sheltered nooks, and look after them with extra care for a week or two. Good Celery cannot be grown by the haphazard gardener. When to Plant Endives.—Sow a small quantity in moderate heat for the first supply, in drills six inches apart, and when an inch high prick out on to a bed of rich light soil. When to Plant Herbs.—Chervil, Fennel, Hyssop, and other flavoring and medicinal Herbs, may be sown now better than at any other time, as they will start at once into full growth, and need little after-care other than thinning and weeding. Rich soil is not required, but the position must be dry and sunny. When to Plant Leeks. Leeks can be sown again if the former sowing is insufficient or has failed. When to Plant Lettuce. Lettuce can be sown for succession, the quick tender-hearted kinds being the best to sow now. Plant out from frames and seed trays. A few forward plants may be tied, but as a rule tying is less desirable than most people suppose. Certainly, after tying, the hearts soon rot if not quickly eaten; and Lettuces as fine as can be desired may now be grown without tying, the close-hearting sorts being very much improved in that respect. When to Plant Melons.—Sow again for a second crop in houses, and grow the plants in pots until they reach a foot high. The early crop will then be ripe, and the house can be cleared and syringed for a fresh start. From this sowing fruit should be ready about the beginning of July. The frame culture advised for Cucumbers will be right for Melons, until the fruits attain the size of a small orange. Then a thorough soaking must be given, and under proper management no more water should be necessary. A dry atmosphere and free ventilation are essential to bring the fruit to perfection. Stopping must be commenced early by pinching out the leader, and only one eye should be allowed beyond the fruit which are to remain. Six will be enough for one plant to carry, and they should be nearly of a size, for if one obtains a strong lead, it will be impossible to ripen the others. The remainder should be gradually removed while young. The worst foe of the Melon is red spider, and it is difficult to apply a remedy without doing mischief. Water will destroy it, but this may have disastrous results on the fruit. The most certain preventive is stout well-grown plants. Weakly specimens appear to invite attack, and are incapable of struggling against it. Where plants are occasionally lost through decay at the collar, small pieces of charcoal laid in a circle round the stem have proved a simple and effectual antidote. When to Plant Onions.—The plants raised under glass in January or February should be ready for planting out on some favorable day about mid-April. If any mishap has befallen the sowings made in the open in March there must be no delay in resowing early in the present month, for Onions should have good hold of the ground before hot weather comes. Onions for pickling should be grown thickly on poor ground made firm. The plants are not to be thinned, but may be allowed to stand as thick as pebbles on the seashore. The starving system produces abundance of small handsome bulbs that ripen early, which are the very things wanted for pickling. The Queen and Paris Silver-skin are adapted for the purpose. When to Plant Parsley. It is to be sown in quantity for summer and autumn supply; thin as soon as up, to give each plant plenty of room. When to Plant Peas. They are to be sown again for succession. When to Plant Potatoes.—Take the earliest opportunity of completing the planting of main crops. When to Plant Salsify.—This delicious root, which is sometimes designated the 'Vegetable Oyster,' requires a piece of ground deeply trenched, with a thick layer of manure at the bottom of the trench, and not a particle of manure in the body of soil above it. The roots strike down into the manure, and attain a good size combined with fine quality. If carelessly grown, they become forked and fibrous, and are much wasted in the cooking, besides being of inferior flavor. Sow in rows fifteen inches apart, any time from the end of March to the beginning of May. Two sowings will generally suffice. When to Plant Spinach.—Sow the Long-standing variety, which does not run so soon as the ordinary kind. If a plantation of Spinach Beet has not been secured, sow at once, as there is ample time yet for a free growth and a valuable plant. When to Plant Turnips. They are to be sown in quantity. When to Plant Marrows.—An early sowing to be made in pots, in readiness for planting out immediately weather admits of it. Three plants in a pot are enough, and they must not be weakened by excessive heat. When to Plant Winter Greens.—A sowing of Borecole should be made, and if a supply is required in spring, it will be well to sow again in the first week of May. High-Pressure times continue in your vegetable garden, for the heat increases daily, and the season of production is already shortened by two months. 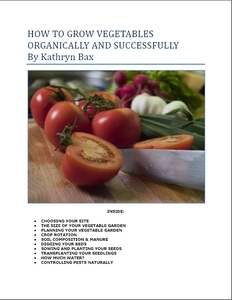 The most pressing business in growing your vegetables is to fix all losses, for even now, if things have gone wrong, it is possible to get up a stock of Winter Greens, and to sow all the sorts of seeds that should have been sown in March and April, with a reasonable chance of profitable results. It must not be expected, however, that the most brisk and skillful can overtake those who have been doing well from the first dawn of spring, and who have not omitted to sow a single seed at the proper time from the day when seed-sowing became requisite. The heat of the earth is now sufficient to start many seeds into growth that are customarily sown in heat a month or two earlier; and, therefore, those who cannot make hot-beds may grow many choice things if they will be content to have them a week or two later than their more fortunate neighbors. In sowing seeds of the more tender subjects, such as Capsicums, Marrows, and Cucumbers, it will be better to lose a few days, in order to make sure of the result desired, rather than to be in undue haste and have the seed destroyed by heavy rains, or the young plants nipped off by frost. Do not, therefore, sow any of these seeds in the open ground until the weather is somewhat settled and sunny, for if they meet with any serious check they will scarcely recover during the whole of the season. When to Plant Asparagus - Plant asparagus in seed-beds to be thinned as soon as possible, so that wherever two or three plants rise together, the number should be reduced to one. But there is time yet for seedlings to appear. The bearing beds are more attractive, for they show their toothsome tops. The cutting must be done in a systematic manner, and if practicable always by the same person. It is better to cut all the shoots as fast as they attain a proper size, and sort them for use according to quality, rather than to pick and choose the fat shoots and throw the whole plantation into disorder. Green-topped Asparagus is in favor in this country; but those who prefer it blanched have simply to earth it up sufficiently, and cut below the surface, taking care to avoid injuring the young shoots which have not pushed through. It is not for us to decide on any matter of individual taste, but we will give a word of practical advice that may be of value to many. It is not the custom to protect Asparagus in open beds, but it should be; for the keen frosts that often occur when the sticks are rising destroy a large number. This may be prevented by covering with any kind of light, dry litter, which will not in the least interfere with that full greening of the tops which some people generally prefer, because the light and air will reach the plant; but the edge of the frost will be blunted by the litter. If there is nothing at hand for this purpose, let someone go round with the sickle and cut a lot of long grass from the rough parts of the shrubbery, and put a light handful over every crown in the bed. The sticks will rise with the litter upon them like nightcaps, and will be plump and green and unhurt by frost. When to Plant Dwarf French Beans.—The main crops should be got in this month, and successive sowings may be made until the early part of July. Dwarf Beans are but seldom allowed as much space as they require, and the rows therefore should be thinned early, for crowded plants never bear so well as those that enjoy light and air on all sides. In Continental cookery a good dish is made of the Beans shelled out when about half ripe. These being served in rich gravy, are at once savory and wholesome. Almost all the varieties of the Dwarf and Climbing sections may be used in this way, and the Beans should be gathered when full grown, but not yet ripe. The self-colored varieties are also grown for use as dry Haricots, in which case the pods should not be removed until perfectly ripe. When to Plant Climbing French Beans.—Sow this month for the main crop, and onwards until June according to requirements. In a general way the treatment usual for Runners will answer well for outdoor crops of the Climbing French Bean. When to Plant Runner Beans.—In the open ground sowings may be made as soon as conditions appear safe, but it is well to sow again at the end of the month or in June. When to Plant Beets.—The main crop should be sown in the early part of the month. Thin and weed the early sown, and if the ground has been suitably prepared, it will be needless to give water to this crop. As Beet is not wanted large, it is not advisable to sow any great breadth until the beginning of May, or it is liable to become coarse. When to Plant Broccoli - Broccoli can be sown for succession. Plant out from frames and forward seed-beds at every opportunity. About the middle of the month sow for cutting in May and June of next year. When to Plant Brussels Sprouts.—For the sake of a few fine buttons in the first dripping days of autumn, when Peas and Runners and Marrows are gone, put out as soon as possible some of the most forward plants, giving them a rich soil and sunny position. When to Plant Cabbage.—Plant out from seed-beds at every opportunity, choosing, if possible, the advent of showery weather. Sow the smaller sorts and Coleworts, especially in favored districts where there is usually no check to vegetation until the turn of the year. When to Plant Capsicum. They can be sown out of doors about the middle of the month, and nice green pods for pickling may be secured in the autumn. When to Plant Carrots.—Thin the main crops early, and sow a few rows of Champion Horn or Intermediate, for use in a small state during late summer, when they make an elegant and delicate dish. When to Plant Cauliflowers. They must have water in dry weather; they are the most hungry and thirsty plants in the garden, but pay well for good living. Plant out from frames as fast as ready, for they do no good to stand crowded and starving. When to Plant Celery. Trenches must be prepared in time, though, strange to say, this task is generally deferred until the plants have really become weak through overcrowding. In a small garden it is never advisable to have Celery very forward, for the simple reason that trenches cannot be made for it until Peas come off and other early crops are over. To insure fine Celery the cultivator must be in advance of events rather than lag behind them. Plenty of manure must be used; it is scarcely possible, in fact, to employ too much, and liberality is not waste, because the ground will be in capital condition for the next crop. There are many methods of planting Celery, but the simplest is to make the trenches four feet apart and a foot and a half wide, and put the plants six to nine inches apart, according to the sorts. This work must be done neatly, with an artistic finish. In planting take off suckers, and if any of the leaves are blistered, pinch the blisters, and finish by dusting the plantation with soot. As Celery loves moisture, give water freely in dry weather. When to Plant Cucumbers. Cucumbers of excellent quality may be grown on ridges or hills, should the season be favorable. Suppose the cultivator to have the means of obtaining plenty of manure, ridges, which are to run east and west, are preferable to hills. The soil should be thrown out three feet wide and two feet deep, and be laid up on the north side. Then put three feet of hot manure in the trench, and cover with the soil that was taken out, so as to form an easy slope to the south, and with a steep slope on the north side carefully finished to prevent its crumbling down before the season ends. The plants should be put out on the slope as soon as possible after the ridges are made ready, under the protection of hand-lights, until there is free growth and the weather has become quite summery. It is a good plan to grow one or two rows of Runner Beans a short distance from the ridge on the north side to give shelter, and in case of bad weather after the plants are in bearing, pea-sticks or dry litter laid about them lightly will help them through a critical time, but stable manure must not be used. In case manure is not abundant, make a few small hills in a sheltered, sunny spot, with whatever material is available in the way of turf, rotten manure, or leaf-mold, taking care that nothing injurious to vegetation is mixed with it. Put several inches of a mixture of good loam and rotten manure on the hills, and plant and protect as in the case of ridges. If plants are not at hand, sow seeds; there will still be a chance of Cucumbers during July, August, and September; for if they thrive at all, they are pretty brisk in their movements. Three observations remain to be made on this subject. In the first place, what are known as 'Ridge' Cucumbers only should be grown in the open air; the large sorts grown in houses are unfit. In the second place, the plants should only be pinched once, and there is no occasion for the niggling business which gardeners call 'setting the bloom.' Provide for their roots a good bed, and then let them grow as they please. In the third place, as encouragement, we feel bound to say that, as Cucumbers are grown to be eaten as well as to be looked at, those from ridges are less handsome than house Cucumbers, but are quite equal to them in flavor. When to Plant Dandelion. These somewhat resemble the Endive, and is one of the earliest and most wholesome additions to the salad-bowl. Sow now and again in June, in drills one foot asunder, and thin out the plants to one foot apart in the rows. These will be ready for use in the following winter and spring. When to Plant Gourd and Pumpkins.—An early show of fruit necessitates raising seeds under glass for planting on prepared beds, and the plants must be protected by means of lights or any other arrangement that can be improvised as a defense against late frosts. Of course the seeds can be sown upon the actual bed, but it is a loss of time. The rapidity with which the plants grow is a sufficient indication that generous feeding and copious supplies of water in dry weather are imperative. When to Plant Lettuce.—Sow for succession where the plants are to remain, and plant out the earlier sowings at every opportunity. To insure a quick growth, and prevent the plants from running to seed, extra care in giving water and shade will be necessary after transplanting. The larger Cabbage Lettuces will prove useful if sown now. When to Plant Maize and Sugar Corn. Sow early in the month on rich light soil, and in a hot season, especially when accompanied by moisture, there will be rapid growth. The cobs to be gathered for cooking when of full size, but while quite green. When to Plant Melons.—It is not too late to grow Melons in frames, provided a start can be made with strong plants. When to Plant Peas.—Sow Peas again if there is any prospect of a break in the supply. It is a good plan to prepare trenches as for Celery, but less deep, and sow Peas in them, as the trenches can be quickly filled with water in case of dry weather, and the vigorous growth will be proof against mildew. When to Plant Savoy sown now will produce small useful hearts for winter use. By many these small hearts will be preferred to large ones, as more delicate, and therefore a sowing of Tom Thumb may be advised. When to Plant New Zealand Spinach can be sown in the open ground in the early part of this month and should be thinned to about a yard apart. The growth somewhat resembles that of the Ice Plant. The tender young tops are pinched off for cooking, and they make an elegant Spinach, which is free from bitterness, and is therefore acceptable to many persons who object to the sooty flavor of ordinary Spinach. When to Plant Tomatoes.—By the third week in May the plants for the open border should be hardened. In a cold pit or frame they may be gradually exposed until the lights can be left off altogether, even at night. A thick layer of ashes at the bottom of the frame will insure drainage and keep off vermin. If the plants are allowed plenty of space, and are well managed, they will possess dark, healthy foliage, needing no support from sticks until they are in final quarters. Do not put them out before the end of the month or the beginning of June, and choose a quiet day for the work. If possible, give them a sunny spot under the shelter of a wall having a southern or western aspect. On a stiff soil it is advisable to plant on ridges, and not too deeply; for deep planting encourages strong growth, and strong growth defers the production of fruit. Tomatoes are sometimes grown in beds, and then it is necessary to give them abundant room. For branched plants three feet between the plants in the rows, and the rows four feet apart, will afford space for tying and watering. Each plant should have the support of a stout stake firmly fixed in the soil, and rising four feet above it; and once a week at least the tying should be attended to. As to stopping, the center stem should be allowed to grow until the early flowers have set. It is from these early flowers that outdoor Tomatoes can be successfully ripened, and the removal of the main shoot delays their production. But after fifteen or twenty fruits are visible the top of the leading stem may be shortened to the length of the stake. The fruiting branches should also be kept short beyond the fruit, and large leaves must be shortened to allow free access of sunshine. Should the single-stem system be adopted, three feet between the rows and two feet between plants in the rows will suffice. On a light soil and in dry weather weak liquid manure may, with advantage, be alternated with pure water, but this practice must not be carried far enough to make the plants gross, or ripening will be delayed. Fruit intended for exhibition must be selected with judgment, and with this end in view four to six specimens of any large variety will be sufficient for one plant to bring to perfection. When to Plant Turnips for succession. It is well now to keep to the small white early sorts. When to Plant Marrows.—In cottage gardens luxuriant vines may every year be seen trailing over the sides of heaps of decayed turf or manure. All forward vegetables are prized, and Marrows are no exception to the rule. An early supply from the open ground is most readily insured by raising strong plants in pots and putting them on rich warm beds as early as the season and district will permit. Late frosts must be guarded against by some kind of protection, and slugs must be deterred from eating up the plants. To some extent the vegetable crops will now take care of themselves, and we may consider the chief anxieties and activities of the growing season over. Our notes, therefore, will be more brief. We do not counsel the cultivator to 'rest and be thankful.' It is better for him to work, but he must be thankful all the same, if he would be happy in his healthy and entertaining employment. Watering and weeding are the principal labors of this month, and both must be pursued with diligence. But ordinary watering, where every drop has to be dipped and carried, is often injurious rather than beneficial, for the simple reason that it is only half done. In such cases it is advisable to withhold water as long as possible, and then to give it in abundance, watering only a small plot every day in order to saturate the ground, and taking a week or more to go over a piece which would be done in a day by mere surface dribblings. When to Plant Asparagus should be in full supply, and may be cut until the middle or end of the month. When cutting should cease depends on the district. In the South of England the 14th is about the proper time to make the last cut; north of the Trent, the 20th may be soon enough; and further north, cutting may be continued into July. The point to be borne in mind is that the plant must be allowed time to grow freely without any further check, in order to store up energy for making robust shoots next year. It is a good plan to insert stakes, such as are used for Peas, in Asparagus beds, to give support to the green growth against gales of wind; for when the stems are snapped by storms, as they often are, the roots lose their aid, and are weakened for their future work. When to Plant Beans, both Dwarf and Runner, may be sown about the middle of the month, to supply tender pods when those from the early sowings are past. A late crop of Runners will pay well almost anywhere, for they bear until the frost cuts them down, which may not happen until far into November. When to Plant Broccoli.—- Take advantage of showers to continue planting out. When to Plant Cabbage.—Towards the end of the month sow a good breadth of small Cabbages and Coleworts. They will be immensely valuable to plant out as the summer crops are cleared away. When to Plant Capsicums may be planted out in a sunny sheltered spot. When to Plan Cauliflowers that are transferred now from seed-beds must have plentiful supplies of water, and be shaded during midday for a week. When the heads are visible it is customary to snap one of the inner leaves over them for protection. When to Plant Celery to be planted out without loss of time, in showery weather if possible; but if the weather is hot and dry, shade the plants and give water. The work must be well done, hence it is advisable to lift no more plants than can be quickly dealt with, for exposure tends to exhaustion, and Celery ought never to suffer a check in even the slightest degree. When planted, dust lightly with soot or wood-ashes. Pea-sticks laid across the trenches will give shade enough with very little trouble. When to Plant Chicory.—This wholesome esculent is used in a variety of ways, and is very much prized in some households. The blanched heads make an acceptable accompaniment to cheese, and are much appreciated for salads; they may also be stewed and served with melted butter in the same manner as Sea Kale. To grow large clean roots a deep rich soil is required. If you are going to use manure make sure that it is well rotted and bury it at least twelve inches, because if you don't you will end up with fanged roots. Prepare the seed-bed as for Parsnips, sow in drills twelve inches apart, and thin the plants to nine inches in the rows. In October the roots will be ready for lifting, and ready to be packed in a dark place for blanching. When to Plant Cucumbers for Pickling may be sown on ridges. When to Plant Endives . Endives are not all that popular when there are pleny of lettuce around, but it takes the place of lettuce in autumn and winter, when the more delicate vegetables are scarce. Sow in shallow drills six inches apart. Thin the plants, and transfer the plants to rich light soil. They must be grown on well-manured soil, and water well if the weather is hot. When to Plant Lettuce. Lettuce should be sown as often as possible when the seasons allow. A few rows of large Cos lettuce should be sown in trenches prepared as for celery, thinned and allowed to grow. They will form good hearts, and are valued when lettuces are scarce. When to Plant Melons.—For a final crop in greenhouses sow as previously directed, and grow the plants in pots. Try and encourage quick growth so that they fruit before the end of September. If you find that there isn't a lot of sunshine when they should be ripening, them make sure that the greenhouse is well ventilated, and that they are warm and dry at night. Before they become heavy, make sure that they are well supported if you are growing them vertically, and try and place them on straw, away from the soil if not, to protect them from garden pests. When to Plant Mushrooms may be prepared for now. The first step towards success is to accumulate a long heap of horse-droppings with the least possible amount of litter. Let this ferment moderately, and turn it two or three times, always making a long heap of it, which keeps down the fermentation. When the fire is somewhat taken out of it, make up the bed with a mixture of about four parts of the fermented manure and one part of turfy loam, well incorporated. Beat the stuff together with the flat of the spade as the work proceeds, fashioning the bed in the form of a ridge about three feet wide at the base, and of any length that may be convenient. Give the work a neat finish, or the Mushrooms will certainly not repay you. Put in rather large lumps of spawn when the bed is nicely warm, cover with a thin layer of fine soil, and protect with mats or clean straw. This is a quick and easy way of When to Plant Vegetables - Mushrooms, and by commencing now the season is all before one. Nine times in ten, people begin preparations for Mushroom When to Plant Vegetables - about a month too late, for the spawn runs during the hot weather, and the crop rises when the moderate autumnal temperature sets in. When to Plant Onions to be sown for salads. Forward beds of large sorts to be thinned in good time. The best Onions for keeping are those of moderate size, perfectly ripened; therefore the thinning should not be too severe. When to Plant Peas may still be sown, and as the season advances preference should be given to quick-When to Plant Vegetables - early varieties. When to Plant Turnips may be sown in variety and in quantity after Midsummer Day. Sow on well-prepared ground, and put a sprinkle of artificial manure in the drills with the seed. By hastening the early growth of the plant the fly is kept in check. For gardeners July is in one respect like January; everything depends on the weather. It may be hot, with frequent heavy rains, and vegetation in the most luxuriant growth; or the earth may be iron and the heavens brass, with scarcely a green blade to be seen. The light flying showers that usually occur in July do not render watering unnecessary; in fact, a heavy soaking of a crop after a moderate rainfall is a valuable aid to its growth, for it requires a long-continued heavy downpour to penetrate to the roots. Summer-sown Vegetables for Autumn and Winter use. As the month advances early crops will be finished and numerous plots of ground become vacant. In many gardens it is now the practice to sow in July and August seeds of quick-When to Plant Vegetables - varieties of Vegetables and Salads to furnish supplies through the autumn and early winter months, and this system is strongly to be commended. These sowings not only increase the cropping capacity of the garden but they extend the use of many favorite Vegetables which from spring sowings customarily cease at the end of summer. Two things are essential to success. Early-maturing varieties only should be sown and the plants must be thinned immediately they appear (thus avoiding transplanting), so that they receive no check in growth. The following subjects are especially suited for the purpose: Dwarf French Beans (sow early in July), Beet, Cabbage, Carrot, Cauliflower (sow early in July), Italian Corn Salad, Cress, Endive, Kohl Rabi, Lettuce, Onion, Parsley, Peas, Radish, Spinach, and Turnip. Potatoes may also be planted in July, but only tubers of early varieties saved from the preceding year should be used. Garden Rubbish is awful if not sorted. The stumps of Cabbages and Cauliflowers smell terribly, and you don't want to upset the neighbors. The short and easy way with all soft decaying rubbish is to put it at the bottom of a trench when preparing land for planting. There it stops being a nuisance and becomes a valuable manure. When to Plant Beans.—A few Dwarf French Beans may still be sown to extend outdoor crops to the latest possible date. For autumn and winter supplies sowings of the Dwarf and Climbing classes may be made from mid-July to mid-September, the dwarfs in cold frames and the climbers on narrow borders in any house that can be spared for the purpose. When to Plant Broccoli to be planted out as before; many of the plants left over from former plantings will now be stout and strong, and make useful successions. When to Plant Cabbages.—The sowing of Cabbage seed at this period of the year is not easy. When the crop has passed the winter there is a danger that the plants may bolt, instead of forming hearts. In the great majority of such cases the loss is attributed to an unwise selection of sorts. For sowing in spring there is quite a long list of varieties, many of them possessing distinctive qualities which meet various requirements. It is unwise now. The Cabbages that can be relied on to finish well in spring are comparatively few in number. But repeated experiments have demonstrated that loss and disappointment can be avoided by sowing only those varieties which show no tendency to bolt. Another, but minor, cause of Cabbages starting seed-stems is premature sowing. The exact date for any district must be determined by the latitude and the aspect of the place. In the North sowing will, of necessity, be earlier than in the Midlands or the South. Assuming, however, that suitable varieties are chosen, the whole difficulty can be disposed of, even on soils where Cabbages show an unusual tendency to send up seed-stems prematurely, by sowing in August instead of in July. The seed-bed should be nicely prepared, and any old plaster, or other rubbish containing lime, should be dug in. Sow thinly, for a thick sowing makes a weak plant, no matter how severely it may be thinned afterwards. When to Plant Cardoons.They should be thinned to one plant in each station, and that, of course, the strongest. When to Plant Carrots.—Frame culture of small sorts should commence, to produce a succession of young Carrots for table. When to Plant Celery to be planted out in showery weather. It is too late to sow now, except for soups, and for that purpose only a small sowing should be made, as it may not come to anything. When to Plant Chards.—Those who care for Chards must cut down a number of Globe Artichokes about six inches above ground, and, if necessary, keep the plants well watered to induce new growth, which will be ready for blanching in September. 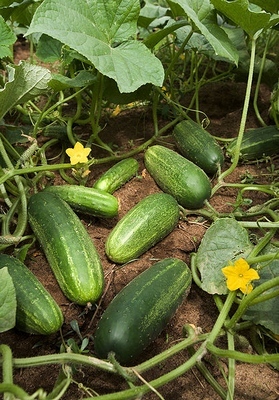 When to Plant Cucumbers on ridges generally do well without water, but they must not be allowed to suffer from drought. If watering must be resorted to, make sure first of soft water well warmed by exposure to the sun, and water liberally three or four evenings in succession, and then give no more for a week or so. When to Plant Endives.They should be sown for winter. It will be well to make two sowings, say on the first and last days of the month. Garlic and Shallots. They should be taken up in suitable weather, and it may be necessary to complete the ripening under shelter. When to Plant Leeks. These need to be planted out; and on dry soils, in trenches prepared as for Celery. When to Plant Parsley. It should be sown for winter use. It is a most important matter, even in the smallest garden, to have a constant supply. When to Plant Peas.—Only quick-When to Plant Vegetables - early varieties should be sown now. When to Plant Potatoes.—Where there is a good crop of an early variety it should be lifted without waiting for the shaws to die down. The tender skins will suffer damage if the work is done roughly, but will soon harden, and the stock will ripen in the store as perfectly as in the ground. It needs some amount of courage to lift Potatoes while the tops are still green and vigorous, and it should not be done until the roots are fully grown and beginning to ripen. Quick sorts may be planted to dig as new Potatoes later in the year. When to Plant Radishes.—Sow the large-When to Plant Vegetables - kinds for winter use. When to Plant Spinach.—Sow the Prickly-seeded to stand the winter, selecting for the seed-bed ground lying high and dry that has been at least twice dug over and has had no recent manure. The twice digging is to promote the destruction of the 'Spinach Moth' grub, which the robins and thrushes will devour when exposed by digging. These grubs make an end of many a good breadth of Winter Spinach every year, and are the more to be feared by the careless grower. When to Plant Turnips to be sown in quantity in the early part of the month; thin advancing crops, and keep the hoe in action amongst them. When to Plant Winter Greens of all kinds to be planted out freely in the best ground at command, after a good digging, and to be aided with water for a week or so should the weather be dry. The importance of summer-sown Vegetables and Salads is dealt with under July, and seeds of most of the vegetables written about may still be put in as ground becomes vacant. The supplies of the garden during the next winter and spring will greatly depend upon good management now, and the utmost must be made of the few weeks of weather that remain. One great difficulty in connection with sowing seed at this period of the year is the likelihood of the ground being too dry; yet it is most unwise to water seeds, and it is always better if they can be got up with the natural moisture of the soil alone. However, in an extreme case the ground should be well soaked before the seed is sown, and after sowing covered with hurdles, pea-sticks, or mats until the seeds begin to sprout. Artichokes - to be cut down as soon as the heads are used. Broccoli - to be planted out now. As the Sprouting Broccoli, which belongs to the class of 'Winter Greens,' does not pay well in spring unless it grows freely now, plant it far enough apart; if crowded where already planted to stand the winter, take out every alternate plant and make another plantation. When to Plant Cabbages.—In many small gardens the August sowing of Cabbages is made to suffice for the whole year, and in the largest establishments greater breadths are sown now than at any other period. But whether the garden be small or large, it is not wise to rely exclusively on the sowing of any one kind. At least two varieties should be chosen, and as a precaution each variety may be sown at two dates, with an interval of about a fortnight between. The wisdom of this arrangement will be evident in nine seasons out of ten. It allows for contingencies, prolongs the season of supply, and offers two distinct dishes of a single vegetable—the mature hearts, and the partially developed plants, which differ, when served, both in appearance and in flavor. Where the demand is extensive, or great diversity is required, three or four kinds should be sown, including Red Cabbage to produce fine heads for pickling next year. Cardoons.—Commence blanching if the plants are ready. When to Plant Cauliflower.—Seed sown now will produce finer heads in spring and early summer than are generally obtained from a January or February sowing. The time to sow must be determined by the climate of the district. In cold, late localities, the first week is none too early; from the 15th to the 25th is a good time for all the Midland districts; and the end of the month, or the first week of September, is early enough in the South. In places like Devon and Cornwall the sowing is later still. But whatever date may suit the district, the seed should be sown with care, in order that a healthy growth may be promoted from the first. Winter the plants in frames or by other convenient means, but it is important to keep them hardy by giving air at every favorable opportunity. Celery to be carefully earthed up as required. It takes five weeks or more to blanch Celery well, and as the earthing up checks growth, the operation should not be commenced a day too soon. Take care that the earth does not get into the hearts. When to Plant Corn Salad should be sown during this month and September to produce plants fit for use in early spring. In the summer months the whole plant is edible, but in winter or spring the outer leaves only should be used. When to Plant Cucumbers.—For a supply of Cucumbers during the winter months the general principles of management are identical with those given under January and March, with one important exception. At the commencement of the year a continued increase of light and warmth may be relied on. Now there will be a constant diminution of these vital forces. Hence the progress of the plants will gradually abate as the year wanes, and due allowance must be made for the fact. So much depends on the character of the autumn and winter that it will be unwise to risk all on a single sowing. Seed put in on two or three occasions between the end of August and the end of October will provide plants in various stages of growth to meet the exigencies of the season. The production of Cucumbers will then depend on care and management. In very dull cold weather it may be dangerous to syringe the foliage, but the necessary moisture can be secured by sprinkling the floor and walls. When to Plant Endives.—Make a final sowing, and plant out all that are large enough, selecting, if possible, a dry, sloping bank for the purpose. When to Plant Lettuce. These should be sown to stand the winter, choosing the hardiest varieties. In cold districts the middle of the month is a good time to sow; in favored places the end of the month is preferable. When to Plant Onions. Hardy types of onions can be sown now. Two sowings—one at the beginning, the other at the end of the month—should be done for best results. The storage of Onions is not often done well, resulting in losses through mildew and premature growth. If any are as yet unripe, spread them out in the sun in a dry place, where they can be covered quickly in case of rain. In wet, cold seasons, it is sometimes necessary to finish the store Onions by putting them in a nearly cold oven for some hours before they are stored away. Peas.—Crops coming forward for late bearing should have attention, more especially to make them safe against storms by a sufficiency of support, and in case of drought to give abundance of water. Strawberry Plants. These may be put in should the weather prove favorable; but next month will be better. In hot weather it is well worth while to bed the plants closely in a moist shady place until rain comes, and then plant out. Tomatoes. These should be gathered as soon as ripe. If bad weather interferes with the finishing of the crop, cut the full-grown fruit with a length of stem attached, and hang them up in a sunny greenhouse, or some other warm spot in full daylight. Seed sown now or in September will produce plants that should afford fine fruit in March, and it will need care and judgment to carry them safely through the winter. When to Plant Turnips. These may be sown in the early part of the month. The best sorts now are White Gem, or Snowball. All the Year Round will please those who like a yellow Turnip. Weeds will be troublesome to the overworked and the idle gardener, while the best-kept land will be full of seeds blown upon it from the sluggard's garden, and the first shower will bring them up in terrific force. All that we have to say about the weeds is that they must be kept down, as they not only choke the rising crops in seed-beds and spoil the look of everything, but they very much tend to keep the ground damp and cold, when, if they were away, it would get dry and warm, to the benefit of all the proper crops upon it. Neglect will make the task of eradication simply terrible, and, in the meantime, every crop on the ground will suffer. The two great months for weeds in the northern hemisphere are May and September; but often the September weeds triumph, because the mischief they do is not then so obvious to the casual eye. As there are now many used-up crops that may be cleared away from your vegetable gardens, large quantities of Cabbage, Endive, Lettuce, and even thinnings of Spinach may be planted out to stand the winter. Cabbages.—We advocate crowding the land now with Cabbage plants, for growth will be slow and the demands of the kitchen constant. Crowding, however, is not quite the same thing as overcrowding, and it is only a waste of labor, land and crop to put the plants so close together that they have not space for full development. The usual rule in planting out the larger sorts of Cabbage at this time of the year is to allow a distance every way of two feet between the plants. The crowding principle may be carried so far as to put miniature Cabbages between them, but only on the clear understanding that the small stuff is all to be cleared off before spring growth commences, and the large Cabbages will then have proper space for development. When to Plant Cauliflower.—Sow again in a frame or in a pan in the greenhouse. Celery.—Continue to earth up, selecting a dry time for the task. Chards. These take quite six weeks to blanch by means of straw, covered with earth. Cucumbers for the winter need careful management and suitable appliances. See the remarks on this subject under August. Endives. These need to be planted out as directed last month. Plant a few on the border of an orchard-house, or in a ground vinery, or in old frames for which some lights, however crazy, can be found. Lettuces. These should be coming in from the garden now in good condition, but the supply will necessarily be running short. Sowings of two or three sorts should be made partly in frames and partly on a dry open plot from which a crop has been taken. The ground should be well dug but not manured. Sow thinly, so that there will not be much need for thinning, and confine the selection to sorts known to be hardy. The August sowings will soon be forward enough for putting out, and it will be advisable to get the work done as early as possible, to insure the plants being well established before winter. Parsley.—The latest sowing will require thinning, but for the present this must not be too strictly carried out; between this and spring there will be many opportunities. Thin the plot by drawing out complete plants as Parsley is demanded for the kitchen. If no late sowing was made, or, having been made, has failed, cut down to the ground the strongest plants, that a new growth may be secured quickly. A few plants potted at the end of the month, or lifted and placed in frames, may prove exceedingly valuable in winter. Potatoes that are ready should be taken up with reasonable care. It is not wise to wait for the dying down of the shaws, because, when the tubers are fully grown, they ripen as well in the store, out of harm's way, as in the ground, where they are exposed to influences that are simply destructive. Spinach.—In favorable seasons and forward localities Winter Spinach sown in the first half of this month will make a good plant before winter. Thin the plants that are already up to six inches apart. Vegetable gardening in October is when weeds and falling leaves are a curse as they affect the crops. They encourage damp and dirt by preventing a free circulation of air amongst the crops, and getting sunshine to the land. Keep all clean and tidy, even to the removal of the lower leaves of Cabbages, when you find them decaying on the plants and lying on the ground. The heavy rains of this month interfere with outdoor work, and are often a great nuisance. The accumulation of rubbish anywhere, even if out of sight, should be dealt with. Make your compost bins, and gather the fallen leaves and make leaf mold. If you are looking for work, use the hoe gently between the crops, taking care not to break or bruise healthy leaves, or to disturb the roots of any plant. Dig vacant plots, and lay the land up in ridges in the roughest manner possible. Heavy land may be manured now with advantage, but it is not desirable to manure light land until spring. Cabbages to be planted out as advised last month. Carrots.—Lift the roots and store in sand. Cauliflowers to be prepared for the winter. Celeriac.—Part of the crop should be lifted and stored in sand; the plants left in the ground to be protected by earthing over. Celery. They must be earthed up, and protecting material got ready to assure its safety during frost. Chicory.—Raise about a dozen plants at a time as required, cut or wrench off the foliage, and pack the roots, crown upwards, in boxes with moist leaf-mold or soil. They must be stored in absolute darkness in some cellar or Mushroom-house which is safe from frost, but a forcing temperature is detrimental to the flavor. Gathering may commence about three weeks after storing. The yield is abundant, and is of especial value for salads through the autumn and winter months. Endives. The must be blanched for use as it acquires full size, but not before, as the blanching makes an end of growth. When to Plant Lettuces.—Continue to plant as before advised, and make a final sowing in frames not later than the middle of the month. Parsnips. They may be dug all the winter as wanted. Although a slight frost will not injure them when left in the ground, protection by rough litter is needful in very severe weather. It often happens that they grow freely soon after the turn of the year, and then become worthless. Potatoes. These should be taken up and stored with all possible speed. Rhubarb. Rhubarb for forcing should be taken up and laid aside in a dry, cool place, exposed to the weather. This gives the roots a check, and constitutes a kind of winter, which in some degree prepares them for the forcing pit. Roots, such as Beet, Salsify, and Turnip, to be taken up as soon as possible, and stored for the winter. Winter Greens. These may still be transplanted, and it is often better to use up the remainder of the seed-beds than to let the plants stand. In the event of a severe winter, these late-planted Greens may not be of much value; but in a mild winter they will make some progress, and may prove very useful in the spring. The remarks about making compost last month also applies to this month. The leaves are falling, the atmosphere is moist, and there should be the utmost care taken not to make things worse by scatterings of vegetable rubbish. Now we are in the 'dull days before Christmas' and time to review the garden. Think of things that were a roaring success and of course those that bombed horribly and plan accordingly. Order seeds, roots, plants, &c., for next season's work, experience and observation can be recorded with a view to future benefit. Consistently with the revision of plans by the fireside, revise the work out of doors. Begin to prepare for next year's crops by trenching, manuring, planting, and collecting stuff to burn in a 'smother.' Land dug now for spring seeds and roots, and kept quite rough, will only require to be leveled down and raked over when spring comes to be ready for seed, and will produce better crops than if prepared in a hurry. Protecting material for all the needs of the season must be done, in view of the fact that a few nights of hard frost may destroy Lettuces, Endives, Celery, and Cauliflowers worth many pounds, which a few shillings'-worth of labor and mulch would have saved. Earthwork can generally be pushed on, and it is good practice to get all road-mending and the breaking up of new ground completed before the year runs out, because of the hindrance that may result from frost, and the inevitable pressure of other work at the turn of the spring. The weather is an important matter; but often the month of November is favorable to outdoor work, and labor can then be found more readily than at most other seasons. Globe Artichokes. They must be protected ere frost attacks them. Cut off the stems and large leaves to within a foot of the ground; then heap up along each side of the rows a lot of dry mulch consisting of straw, pea haulm, or leaves, taking care in so doing to leave free access to light and air. The hearts must not be covered, or decay will follow. Jerusalem Artichokes. They may be dug as needed, but some should be lifted and stored in sand for use during frosts. Asparagus. Asparagus beds not yet cleaned must have prompt attention. Cut down the brown grass and rake off all the weeds and rubbish, and finish by putting on a dressing of seaweed, or half-rotten stable manure. Broad Beans.—It is customary on dry warm soils to sow Beans at the end of October or during November for a first crop, and the practice is worthwhile. On cold damp soils, and on clay lands everywhere, it is a waste of seed and labor to sow now, but every district has its peculiar capabilities, and each cultivator must judge for himself. In any case, Beans sown during this month should be put on well-drained land in a sheltered spot. Broccoli.—In areas where you experience bad weather during this time, lay the plants with their heads facing the north. When to Sew Carrots. Carrots can be sown in frames, and successive sowings made every three or four weeks until February. Cauliflowers. They will be turning in, and possibly those coming forward will be all the better off for being covered with a leaf to protect the heads from frost. If the barometer rises steadily and the wind goes round to north or north-east, draw all the best Cauliflowers, and put them in a shed or any out-of-the-way place safe for use. Celery.—Hard frost coming after heavy rain may prove destructive to Celery; and it is well, if there is a crop worth saving, to cut a trench round the plantation to favor escape of surplus water. If taken up and packed away in a dry shed, the sticks will keep fresh for some time. Horseradish. It needs to be taken up and stored ready for use, and new plantations made as weather permits and ground can be spared. When to Sew Peas.—The sowing of Peas outdoors now is not recommended for all, but only for those who have a good climate and guaranteed success. If you are determined to sow, select for the purpose a dry, light, well-drained sunny border, and make it safe from mice, slugs, and sparrows. The quick round-seeded varieties must be chosen for the purpose, and it will be advisable to sow two or three sorts rather than one only. Peas to be grown entirely under glass may be started now. Sea Kale. It needs to be lifted for forcing. This delicious vegetable may, indeed, be forced for the table in this month; but it is not advisable to be in a hurry, for a fine sample cannot be secured so early. Sea Kale is the easiest thing in the world to force; the only point of importance is to have strong roots to begin with. Any place such as Mushroom-houses, cellars, pits, or old sheds, where it is possible to maintain a temperature of 45° to 55°, may be used for the purpose. Put the plants thickly into pots or boxes, or plant them in a bed, and it is essential to exclude light to insure blanching. By these simple means a regular supply may be obtained until the permanent beds in the open ground come into use. The best advice that can be given for this month is to be prepared for either heavy rain or sharp frost, so that extreme variations of temperature may inflict the least possible injury in the garden. Let the work be done in accordance with the weather, and don't plant on boggy ground or when the frost is still around. Accept every opportunity of wheeling out manure; and as long as the ground can be dug without waste of labor, proceed to open trenches, make drains, and mend walks, because this is the period for improving, and the place must be very perfect which affords no work for winter weather. Make ready pea-sticks, stakes of sizes, and at odd times gather up all the dry stuff that is adapted for a grand 'smother.' A careful forecasting of the next year's cropping will show that even now many arrangements may be made to increase the chances of success. Warm Border to be prepared for early work by digging and manuring. All the refuse turf and leaf-mold from the potting-shed and the soil knocked out of pots may be usefully disposed of by adding it to this border, which cannot be too light or too rich, and a good dressing of manure will give it strength to perform well. Broad Beans. They need to be earthed up for protection and support. Celery. It needs to be earthed up for the last time. In case of severe weather, have protecting material at hand in the shape of dry mulch or mats. Pea-sticks make an excellent foundation on which to throw mulch, mats, etc., for quickly covering Celery, the protection is easily removed when the frost is over, and costs next to nothing. Endives. Endives will be valued now, and must be blanched as required. Place a few in frames and other protected spots. In the unused corners of sheds and outhouses they may be safer than out of doors. Parsley.—In all cold districts it is wise to secure a bed of Parsley, in a frame or pit, or if a few plants were potted in September, they may be wintered in any place where they can have light and air freely. It is so important to have Parsley at command as wanted, that it may be worth while to put a frame over a few rows as they stand in the open quarter, rather than risk the loss of all in the event of severe weather. When to Plant Radishes.—Sow one of the long sorts for a first supply in some warm spot, to secure quick growth. Underground Onions can be planted in rows one foot apart. They should not be earthed up, for the young bulbs form round the stems in full daylight. Have you ever thought, "How many vegetables do I need to plant for my family?"